GL Floors Have supplied and fitted Kahrs hardwood floors to the award winning residential development at West Burn Lane St. Andrews. This High end contemporary development, designed by Edinburgh Architects Sutherland Hussey Harris has been awarded "Best building in Scotland" prize by the Royal incorporation of Scottish Architects. An old floor that appears to be way beyond restoration can be repaired and refirbished to achieve unbelievable results. 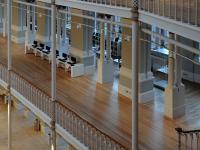 Restoration of the national Museum of Scotland in Chambers Street.